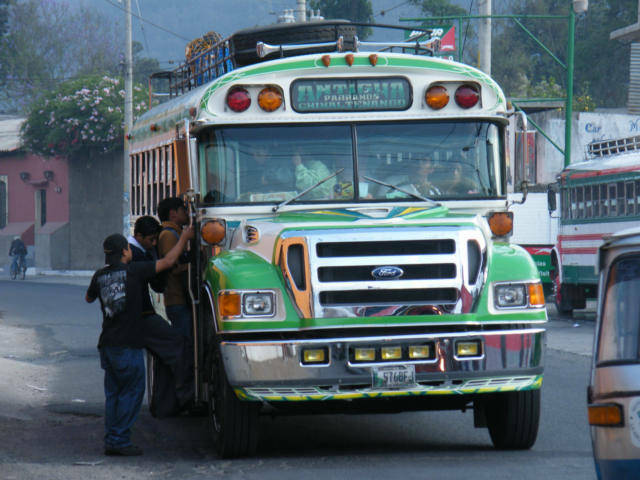 The Chicken Bus won, this is a used American School Bus sent to Guatemala and made into public transportation. I like Chicken Buses better than Shuttle Vans. Chickens bus, I do not think the locals call it this… I am sure on occasions a chicken or two uses the bus. I am Chicken to use the small shuttle vans anymore; the Chicken bus has become my favorite mode of travel on short trips in Guatemala. Chicken Buses, cheap and convenient form of Transportation in Guatemala. With a Chicken bus, you do not have to plan, just leave and you will arrive after an experience of a lifetime. I believe a volunteer in this country should be required to only use Chicken buses. On the last trip from Antigua to Panajachel in a Shuttle Van, I got motion sickness, puked out the window, in a plastic bag, and was miserable for the whole next day recovering from the trip. I think there were three or four people puking, the driver finally stopped and allowed us to revive, and he for sure was not helping by riding the break. Private Car - Too dangerous, I have only been here a few weeks and I already know two people who were robbed at gunpoint. Hired Taxi - Same as private car, probably worst, as the driver could be conspiracy to rob you. Shuttle Van - The regular size fan with 12 people packed into it and the drivers a lottery and the seat a lottery. A good seat in the second tier and you optimize your chances of not becoming sick. Pullman Bus - This is a full size bus, however hard to find them to Pana, they seem to leave one time per day, and I waited in Pana for two hours the other time and finally took a Chicken Bus. I do not know about the rest of the world, I came to visit Guatemala. The Chicken Bus is the people of Guatemala cramped three to a seat, full of strange noises, nice people, and stops a lot. It takes a different road or path to Panajachel, one with fewer curves and you must transfer a couple of times. A full size bus is better for sightseeing than a van, it sits up about 3 feet higher, the windows are bigger and you can see the world better, the best possible for photographers is a full size bus. The bottom line is this, I get car sick easy, the shuttle van made 25 percent of the occupants sick. I want to arrive in any city before noon and no later than 2:00, every hour after 2:00 compounds the difficulties of entering a city, the later it gets the more dangerous and stupid it gets. The chicken buses appear to leave continuously all day long. I feel the shuttle van; the 12-passenger type is a bad new trend in travel transportation. I think the average person does not want to touch a Guatemala person, and for sure does not want to sit next to one; therefore, this method of towing tourist is becoming a standard. I am somewhat sad; it is the best way in the world to avoid a cultural experience in Guatemala. The whole world feels this NOT- Private, Not comfortable, not a good way to take photos, cramped, get motion sickness type of vehicle is best. Today, I realized, I just will not try them again, I got sick in Thailand, and many place, this is the last straw, I am chicken bus. I think I have learn more sitting next to people on buses, I know the world better, I can feel the peoples minds at work, I just get to know people sharing a seat.